The miscellaneous adventures of Ben Willmore. Above is a little video Karen made of our time in Hawaii. Note: Many of these are iPhone shots. Here is part two of our Hawaiian interlude. If you read the last blog post, you know that we spent a week on Oahu and then hopped over to Maui. where we spent this past week. Before we left for Maui, we attended a Luau at the Polynesian Cultural Center. Before the feast started, we got to explore the grounds a bit, and were very impressed by their setup. It's a huge park-like village with separate areas for many of the individual Polynesian cultures (Hawaii, Fiji, Tahiti, etc.). At each area, you could see shows, demos, or just explore the buildings. The Luau was fun, and on the way in, we each got a fresh orchid lei. There were hula dancers and live music throughout the whole event. When it was over, we headed over to the large theater for the live show, "Ha: Breath of Life." Karen and I were both pretty surprised at how big of a production it was. There were at least 70 performers, and a huge staff for effects and such. We flew to Maui on Tuesday, where I taught a 3-day Photoshop course at the Maui Institute of Visual Arts. The institute is run by Randy and Becky Hufford, and we stayed in their guest suite during our visit. The course went really well, and all the students seemed to enjoy it a lot. We had one interesting day where the power went out completely, and we all had to work on the battery power from our laptops, with no projector at all! I kept plugging on, and the class seemed to make do just fine, which was great. When I was down to 3% battery life left, I started to wrap things up for the day and that's when the power came back on ... just in the nick of time! We were able to continue the class with no problem. Many thanks to my students and Randy for making the most of the situation! If you read this blog a lot, you know that as we travel around the mainland in the motorcoach, we are constantly running into friends (and making new ones). You would think that out here in Hawaii, we would be less likely to be running into people we know. Well that couldn't be further from the truth! As soon as we landed in Maui, we were picked up at the airport by my great friend Steve. You may have heard me talk about Steve and his wife, Beverly, in many of these posts. They live in Las Vegas and that's one city we've been visiting a lot lately (mostly because of friends and convenience... not because of the "Vegas scene"). In fact, the bus is currently parked in their driveway! Here's what's crazy: It was sheer coincidence that we happened to be traveling to Hawaii at the same time! It sounds almost impossible, but that's how our lives seem to roll. But wait... this gets better. My awesome friend Diane (who is also a mutual friend of Steve and Beverly) happens to live on Maui and was with Steve when he picked us up at the airport. So on our first night on the new island, we had a small gathering of close friends, and considering we hadn't seen Diane in over a year, it was somewhat of a reunion. One morning, we woke up early to go whale watching with my friends Mark and Shayla. I had met them during a previous visit to Maui, where they attended the class I was teaching. They were kind enough to take us out on their boat to search for humpback whales. We spotted several of them, but didn't get close enough to get nice photographs. That's ok, though. We were just thrilled to be able to get out on the water and catch up with Mark and Shayla. Later that day, we went sight-seeing with Steve and Bev all over the south side of East Maui. While I was teaching my three-day class, Karen spent a lot of time exploring the island. This was her first time to Maui, and she wanted to see as much as she could. In just two days, she drove the perimeters of both the east and west sides of Maui, as well as part of the interior. She's going to post a bunch of photos on her blog (as well as some interesting stories from her adventures) and I'll link to it when she does. As I mentioned above, we stayed in Randy and Becky's guest room (aka the Pineapple Love Suite) while we were in Maui and spent a lot of time with them in the evenings. Becky is an incredible chef and had delicious things in store for us every night. Karen has really been getting into cooking lately, so she was eager to soak up all the tips Becky could give her. On Saturday, we had a joint birthday party for Randy and Steve. Everyone had a blast ... maybe too much of a blast, because many of us needed some "recovery time" the following morning! 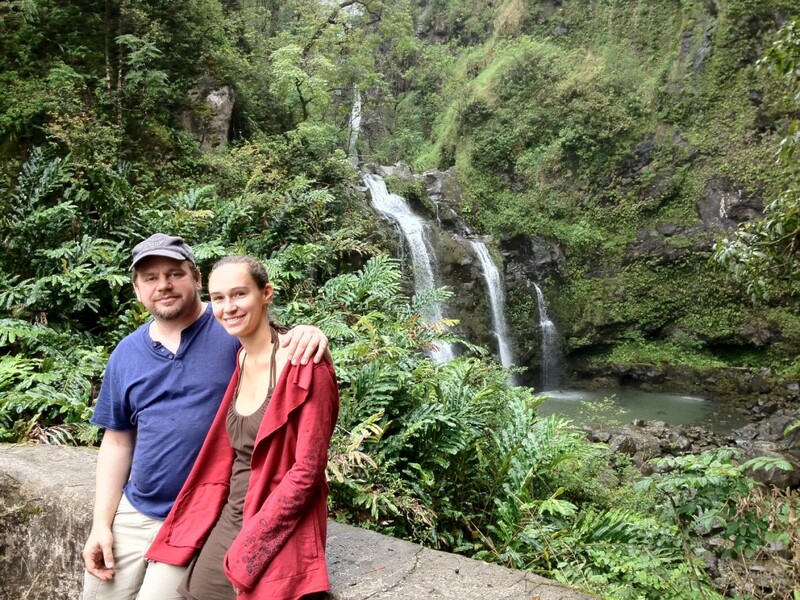 On Sunday, Karen and I drove the famous Road to Hana together, stopping to shoot along the way. It rained for a good part of the way, but cleared up toward the end of our drive and we managed to get some nice late-afternoon/early-evening shots of the coastline at Waianapanapa State Park. Since it would have been a long and dark drive back, we decided to spend the night in Hana, which is where we are as I type this. We're right on the ocean, and the place we're staying is semi-open, so we can hear the wind and the water from the room. Not a bad way to wrap up this post, I'd say! Aloha! Extra note: Karen posted a free desktop calendar wallpaper for March up on her blog, The Pixel Diaries. It features one of her images from Oahu. You can download it HERE.